Used for relieving urinary problems related to benign prostatic hyperplasia (enlarged prostate). Analgesic and anti-inflammatory effects, making it beneficial for treating arthritis. Nettle root extract is widely used in Europe to treat Benign Prostatic Hyperplasia or enlarged prostate gland. It is recommended by Commission E in Germany and by ESCOP (European Scientific Cooperative of Phytotherapy) specifically to relieve urinary problems associated with an enlarged prostate. - the age-related imbalance between levels of testosterone and oestrogen, the latter stimulating prostate growth. Aromatisation converts androgens into oestrogens adding to those already circulating in the blood. - by a direct anti-proliferation action. 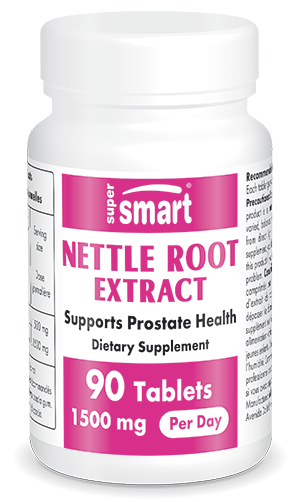 Over 15000 men enrolled in clinical studies have benefited from the effects of nettle root extract leading to significant improvements in prostate size, frequency of urination, nocturnal micturition and post-micturition residue. Nettle root extract is often used in combination with saw palmetto supplement with which it has a synergistic effect. Their efficacy has been compared to that of finasteride, a drug treatment. Nettle root extract combined with saw palmetto supplement achieves similar results to finasteride but without the latter's side-effects (reduction in libido, sexual dysfunction - in some cases, impotence). One observational study involving 419 urologists monitoring 2030 patients over 12 weeks showed beneficial effects, with 85% of patients reporting improvements. Each vegetarian capsule provides 500 mg of nettle root extract (16:1). Take 2 to 3 tablets a day or as advised by your therapist.